Once when I was 18 or 19, a friend sent me this verse after a night of talking. I was a little amused, as I don’t really drink, not that I’m that health-conscious or righteous or anything like that, but really because alcohol is extremely expensive for a poor little student in my country. I’ve been drunk before though, more times than I’d like to admit, in more ways than I’ll ever confess. In this verse getting drunk on wine and being filled with the Spirit seems to be compared. If you have been drunk before, recall it – thank God for those experiences, which will likely allow you to better understand this verse. In this study, we will examine how being filled with the Spirit is like through a cross-examination of what getting drunk on wine is like. As for the debauchery part… oh well, we won’t go too much into it today. There are plenty of verses that talk about staying away from drunkenness. Do not get drunk on wine – Is drinking alcohol wrong? I don’t think this verse, or any verse from the Bible, prohibits the drinking of alcohol, especially for honest, lawful and not excessive use. In John 2:1-10 Jesus changes water into wine – the serving wine to guests was a frequent occurrence. We’re also told that wine is delightful – though not as much as the love of God – Let him kiss me with the kisses of his mouth — for your love is more delightful than wine. [Song 1:2|Article]. We’re told not to linger over wine – Those who linger over wine, who go to sample bowls of mixed wine [Prov 23:30]; and we’re told not to drink too much wine – Do not join those who drink too much wine or gorge themselves on meat [Prov 23:20]. How much is too much wine? There is no quantity stated – we are not told we can’t drink more than ten pints a day or anything like that – half a pint may make me drunk, but it may take you a hundred. It’s not about how much we drink, but about our motives – do you drink in search for that fleeting ecstasy, where you lose control of yourself? Self-control is one of the fruits of the spirit [Gal 5:23]- and drunkenness often leads to a compromise of our self control. Without self-control, all our other Christian values will be compromised. Without self-control, the amount of time that we’ve spent into moulding ourselves, bettering ourselves, improving ourselves in certain aspects would be wasted, because we lose all that control. which leads to debauchery – We don’t even have to look into the Bible to know how influential and disastrous alcohol can be. Numerous crimes were committed under the influence of alcohol. Drink-driving has led to the loss of numerous lives all over the world. Drunken fights, domestic violence, suicides sexual sins etc. in most parts of the world, beer is actually very cheap. Drinking itself is not a crime, nor is it a sin. There are people who do not drink at all, and good for them indeed, but drinking itself is not a sin. It is simply an act that, if abused, leads to sin. Wine is a mocker and beer a brawler; whoever is led astray by them is not wise [Prov 20:1]. 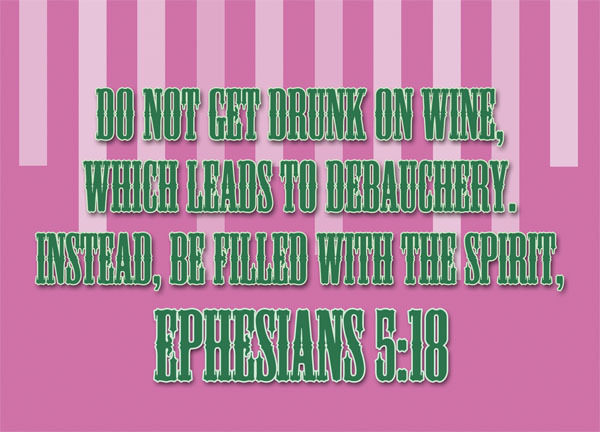 Be filled with the Spirit – as Christians, we have no need to escape into drunkenness. We have no need to turn to alcohol for that fleeting sense of reprieve, because we can turn to God, who is capable of giving us permanent reprieve. Instead of being filled with drunkenness, we can be filled with the spirit. If you have a spectrum, and total self-control is in the middle, the loss of self-control through drunkenness would be on one end, and the giving up of personal will through the filling of the spirit would be on the other end. Or maybe it would be more accurately portrayed as a triangle, with each of the three at each points. In a sense, drunkenness is rather similar to being filled with the spirit – in drunkenness you lose your self-control, while in being filled with the spirit you are willing to follow God’s will ahead of your personal desires. I don’t necessarily mean that being filled with the spirit means losing self-control – although some may argue for that. I believe that as one of the fruit of the spirit, we are never meant to lose our self-control, especially when filled by the spirit itself. Have you ever done a rare, stupid and impractical act of kindness in a moment of craziness and when it’s over, you’re in disbelief that you’ve actually done that? That’s what I mean, or something along those lines. Those sudden impulsive acts won’t be anything bad or shameful, because you still have your sense of self control. Being intoxicated with drunkenness will lead us to debauchery. Being filled with the Spirit won’t – most certainly not. When you are sad, when you are upset, when you need an escape – turn not to alcohol. Instead, turn to God, and turn to the Spirit. It’s a healthier, safer, and better option.